Watch Scott's webcast and earn SHRM Certification PDCs. We know HR practices have a significant impact on an organization's bottom line, but too often HR leaders fail to demonstrate direct connections to the business metrics that matter most to executives. 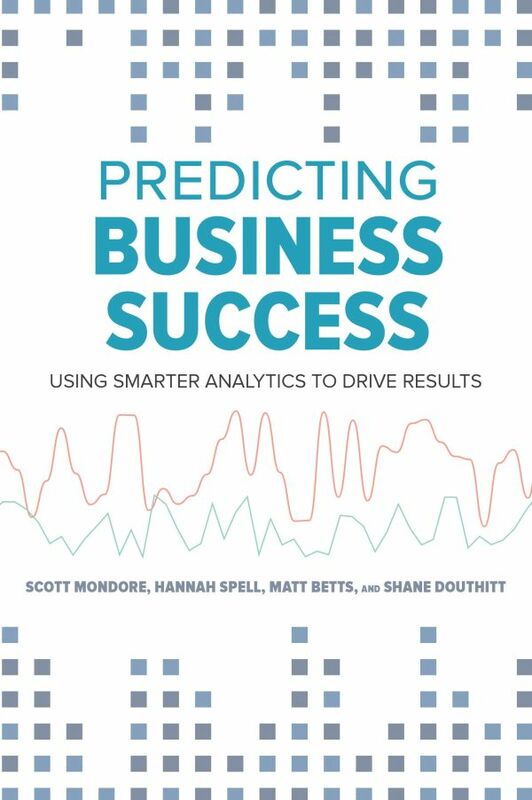 Predicting Business Success goes beyond the usual slicing and dicing of HR data to show HR professionals how to definitively connect the dots between people data and business outcomes with a straightforward approach for scaling analytics to all leaders and all levels, detailed strategies for collecting key data elements and making talent profiles predictive, and proven guidelines for harnessing data for selection and recruitment, onboarding, employee surveys, training needs, and much more. Scott Mondore, PhD, is cofounder and managing partner of Strategic Management Decisions (SMD). He has over twenty years of experience in the areas of strategy, talent management, measurement, customer experience, and organizational development. Before starting SMD, he was the eastern region president for a healthcare survey organization, a corporate strategy director at Maersk, and an organizational effectiveness leader at UPS. He is the coauthor of Investing in What Matters: Linking Employees to Business Outcomes (SHRM, 2009) and Business-Focused HR: 11 Processes to Drive Results (SHRM, 2011). Hannah Spell, PhD, is director of research and analytics at SMD. Before joining SMD, she worked for the federal government, on nonprofit research grants, and at State Farm, leading numerous research initiatives, conducting advanced analytics around HR issues, and providing internal consulting services. She has experience with research programs, HR measurement and analytics, survey design and implementation, and action-planning and strategy. Matthew Betts, PhD, is director of consulting at SMD. He delivers support to all SMD’s clients, including conducting ongoing survey maintenance and development, performing advanced analytics, creating presentations, and presenting results. Prior to joining SMD, he worked for State Farm and Corporate Executive Board (CEB), providing internal consulting, leading various research projects, and conducting advanced analytics to predict business outcomes. He has experience with survey design and implementation, competency modeling, and HR measurement and analytics. Shane S. Douthitt, PhD, is cofounder and managing partner of SMD. He has more than twenty-four years of experience in the areas of measurement, talent management, executive assessment and coaching, and organizational development. Before SMD, he was the SVP of sales and product management at Morehead Associates, SVP of Human Resources and Leadership Development at Bank of America, and a consultant for Towers Perrin and IBM. He is the coauthor of Investing in What Matters: Linking Employees to Business Outcomes (SHRM, 2009) and Business-Focused HR: 11 Processes to Drive Results (SHRM, 2011).